The traditional ruler's summit which took place in Port-Harcourt last Tuesday was almost marred by an unpleasant confrontation between the Oluwo of Iwo, Oba Abdurasheed Adewale Akanbi, and the Chief Security Officer (CSO) to the Ooni of Ife, Oba Adeyeye Enitan Ogunwusi, Ojaja II. The tense situation could have snowballed into a bigger crisis but for reason that eventually prevailed. The incident occurred at the Presidential Hotel, Port Harcourt. It was gathered that the Ooni of Ife ,Oba Ogunwusi had just finished giving a vote of thanks, and was on his way back to his seat when his CSO, Mr. Emmanuel Olawale Kolawole, who led other security aides of the monarch allegedly had a brush with the Oluwo, who appeared to be blocking the Ooni from accessing his seat. The Oluwo, it was learnt, was by then discussing with the Minister of Interior, Lt Gen. Abdurahman Dambazzau, who shared the high table with the Ooni and the Rivers State gover, Nyesome Wike. A source in the Oluwo’s court who witnessed the incident alleged that the CSO out of overzealousness threatened to push the monarch if he did not give way for Ooni to pass. He was said to have ignored Oba Akanbi’s entreaties to “take it easy” and pushed him out of the way. A visibly embarrassed Oluwo, who is the Deputy Chairman of the Osun State Traditional Rulers Council had to step aside to pave way for Ooni to get to his seat, the source said. But the media aide to the Ooni, Comrade Moses Olafare, denied that such scenario ever happened in Port Harcourt. Olafare lamented that the report was not only shocking and a big surprise but also misleading, adding that there was no iota of truth in it. Some of the guests at the event, and other eye witnesses accounts reported observing Ooni expressing satisfaction with the conduct of his CSO. Some dignitaries at the event were however taken aback on what they considered as desecration of the crown wondering loudly how Ooni’s CSO could have the effrontery to push a first class paramount ruler of Oluwo’s status. The security detail concerned, Kolawole, also denied pushing the Oluwo or manhandling him, although he admitted in a telephone interview that the had an encounter with the monarch in the course of discharging his legitimate duty. He said he could not have disrespected a revered Oba as a true Yoruba son, but maintained that he had a duty to secure his principal. According to him, when the Ooni finished his speech and was returning to his seat beside the Minister of Interior, Lt. Gen Abdurahman Dambazzau and the Rivers state governor ,as well as some Emirs ,he quickly moved to receive and sit behind him. “I didn’t expect the Oluwo to stand there because his seat was not there. So, I only excused and asked him to move away from there. I didn’t push him as alleged’’. Emmanuel who reiterated that he was only doing his job added; ’’I’m the Ooni’s CSO, and all the other CSOs sat behind their principals. Olafare in a reaction added that there were over 100 journalists and 30 camera men at the event, arguing that if such a thing happened, it would have been reported since last when the event was held. He said there has been no running battle between the Ooni and Oluwo, adding that when the Ooni arrived the venue of the occasion, Oluwo was the first among the set of prominent traditional rulers and guests that he (the Ooni) greeted. He, however, argued that what the Oluwo had misunderstood as a molestation by the Ooni’s CSO was a mere protocol assignment that he (the CSO) had the mandate to perform for his principal. 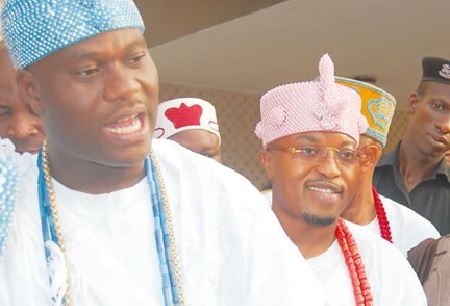 Olafare said that the CSO politely asked the Oluwo to excuse the Ooni to be able to access his seat. He said that in fairness to him, the Oluwo obliged immediately and the Ooni was able to access his seat. “Going to the high table to introduce himself to Dambazzau on the high table while the programme was still on and blocking the Ooni from accessing his seat after delivering his speech and blocking the views of other guests was a breach of protocol on the part of the Oluwo. In any case, when his CSO politely asked him to excuse the Ooni to get to his seat, he obliged in fairness to him and there was no problem. So, it is surprising that Oluwo is now trying to make a case out of this,” Olafare said.